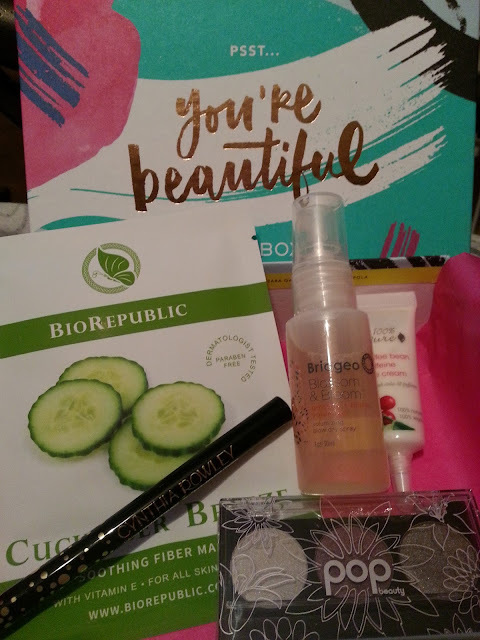 Well, I just realized I still haven't uploaded my Birchbox from September. Oops! I was considering cancelling before Septembers box came, but I was really happy with everything I got, so I kept my subscription. I just got an email recently saying they will finally be letting Canadians choose an extra item to go into their next box. For November they are offering earrings from Baublebar. I won't get too into this though because that should technically be included in my October box review. Anyway, here's what I got in September! Cynthia Rowley - Beauty Liquid Liner in Navy - I love this liner. It applies so easily, it glides. What I don't like is the blue colour they sent me. I have green eyes so I tend to stick to black or brown as liners. I'm just not a fan of blue. I should have kept it sealed and gifted it, but I wanted to see the quality. Pop Beauty - Bright Up Your Life Eyeshadow Trio in Sugar Plum - I have to say I LOVE these eyeshadow colours. There's a silvery white, a plum purple, and a purpley gray. I'm so bad at describing colours, but they are so pretty. The colour payoff is great as well. I had another trio sent from Ipsy months and months ago with brown shades, and it was great too. I'm impressed! Briogeo - Blossom and Bloom - Volumizing Blow Dry Spray - I haven't tried this yet. I don't have fine or limp hair either so I'm not sure if I will be opening it or not. 100% Pure - Coffee Bean Caffeine Eye Cream (for Dark Circles and Puffiness) - My eyes aren't really puffy, but I do suffer from dark circles, and it seems like no amount of sleep, or water I drink, makes a difference. This stuff smells like food. Like coffee, vanilla, chocolate. I've only tried it once so I can't really say I've seen an improvement. But I'm not a fan of putting this scent under my eyes. I would prefer if it had no scent. That being said, it says its 100% natural and 100% vegan. I will have to keep using it to see if it makes any difference on these circles.